An expert reveals a step-by-step process for profiting from trend trading Trend Trading Set-Ups is a vital resource that explains how to identify and measure the strength of a potential trade through the author's Trading Cube method. The method involves monitoring individual stocks, stock sectors, and the overall market in short, medium, and long-term time frames. The best trade setups as viewed through the Trading Cube lens and the book's numerous examples show entry and exit points based on trend transitions witnessed through the Trading Cube. Written by L.A. Little (a professional trader, money manager, and senior contributor to RealMoney.com and TheStreet.com) the book's examples are brought to life through monthly, weekly, and daily charts and are combined with entry and exit techniques-namely anchored support and resistance. The result is a step-by-step process of how to obtain trade entry for the best trades; trades that carry a high reward compared to risk combined with a high probability of success. Offers a clear process for understanding how to enter trades for the best results Shows how to determine stop points and how to measure where to take partial or full profits L.A. Little has been dubbed a "technician extraordinaire" by Jim Cramer on his MadMoney television show Engaging and informative, this book also comes in an enhanced e-book version with multiple videos that describe trade set ups in a dynamic manner, showing the market condition; the planning of the trade; the unfolding market action; and the entering and exiting of the trade. L. A. LITTLE is what Jim Cramer called a "technician extraordinaire" on his Mad Money television show. Little is a professional trader, money manager, and writes frequently for online publications including Minyanville.com and MarketWatch.com while continuing to contribute articles to well-known print publications like Stocks & Commodities, Active Trader, and Traders World. Little has presented in numerous conferences both domestically and internationally, appeared on syndicated radio shows, and provides daily market analysis and the tools to implement the trading strategies covered in this book on his website TAToday.com. With a trading philosophy centered on capital protection first and the accumulation of consistent gains over time, Little espouses a simplistic technical approach to trading the markets that refocuses technical analysis away from patterns to supply and demand levels. 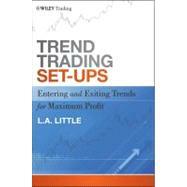 He is the author of Trend Qualification and Trading, also from Wiley.